Ruth Nolan is an author with lifelong Mojave Desert and Inland Empire roots. Her poetry collection Ruby Mountain is forthcoming from Finishing Line Press, and her newest fiction appears in LA Fiction Anthology (Red Hen Press, 2016) and in Desert Oracle. She writes about desert-based American Indian arts and culture for News From Native California, Artbound, Inlandia: A Literary Journey, and Desert Report. Nolan teaches at College of the Desert. Stories from a Paiute Indian elder of traditional chuckwalla hunting techniques who watched a rattlesnake bite—and kill—itself. Stories from a Baker man about the time he hiked far into the Soda Mountains on a hot day, became dehydrated, and walked miles to the nearest bar in town for a thirst-quenching beer, which he credits with saving his life. Stories from a woman who rode a school bus to Death Valley High School that was driven by Edward Abbey. Stories about long desert road trips by a man who showed up on a Harley Davidson and wore his leather motorcycle chaps while he wrote. 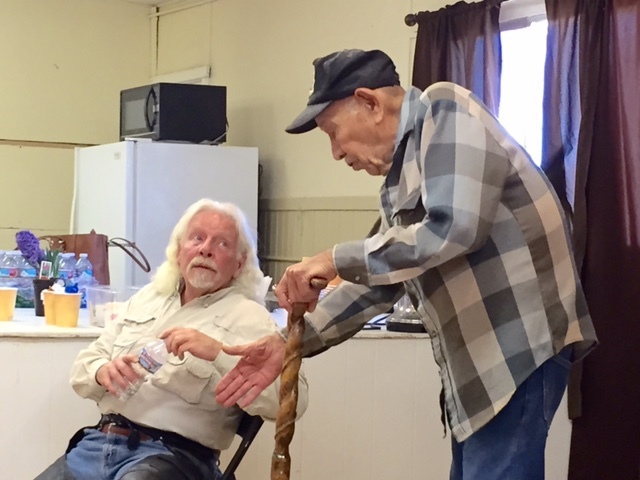 These tales, and more, were among the writing samples penned and shared by the twenty-five participants at the February 15 Shoshone-Tecopa Arts and Literature Festival writing workshop, which I led along with desert author Craig Deutsche. Workshop participants drove long distances across the Mojave Desert from tiny towns with inspiring names like Furnace Creek, Lone Pine, Tecopa, and Wonder Valley. Although some might consider the Mojave Desert an unlikely location for literature to flourish, we were, in contrast, able to demonstrate that the desire and need for a vibrant and community-connective writing workshop is strong and flourishing in this little-known desert region of Southern California. Using prompts drawn from poetry, fiction work, and essays by desert literary greats such as Mary Austin and John Steinbeck, workshop participants wrote their hearts out about their own desert experiences and observations. The holiday tree was brightly decorated with ornaments at the entrance of the Muffin Top Bakery in downtown Redlands, California, and the atmosphere inside was warm and cheery, the smell of cinnamon rolls seasoning the air. But for those who gathered together this past December 20 for the poetry and prose reading, “Songs for San Bernardino,” this was no typical holiday literary event. This reading, which I coordinated with San Bernardino natives and authors Liz Gonzalez and Jessica Wyland, was intended to bring community together through the power of stories of place to help heal from the December 2 shootings at the nearby Inland Regional Center, a tragedy that ripped through the fabric of this proud but often overlooked part of Southern California. Readers at “Songs for San Bernardino” included Chad Sweeney, Casandra Lopez, Frances J. Vasquez, Juanita Mantz, Darlene Kriesel, Alex Avila, Andre Katkov, Liz Gonzalez, Jessica Wyland, and myself, who all have strong connections to San Bernardino. Several read freshly-penned pieces that spoke directly of the impact of December 2, while others read works that reflected the strength, beauty, and strong community spirit of this town. San Bernadino Mayor Carey Davis also spoke. 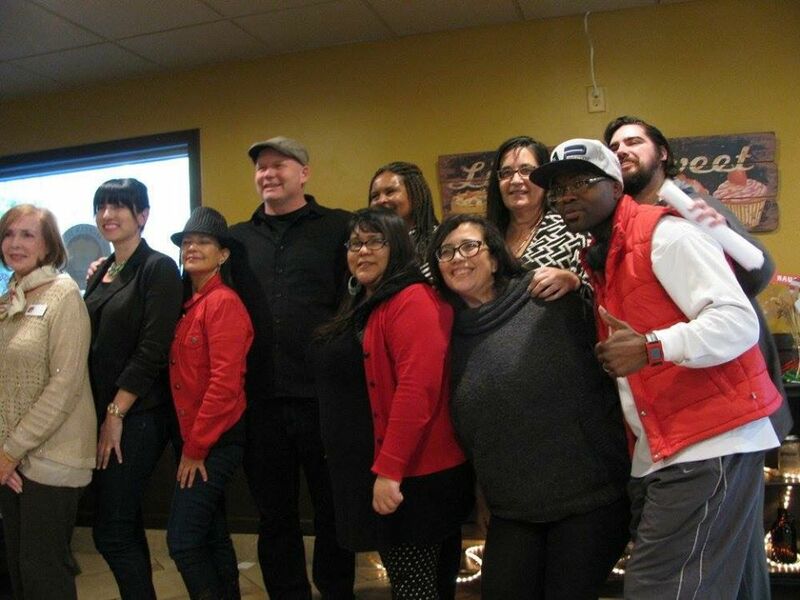 For nearly two hours, all chair and tables at the Muffin Top Bakery were full as the power of the stories and words of some of the Inland Empire’s finest writers gave testimony to the inner strength of this community. Afterwards, the day’s cloudy skies gave way to a gentle late afternoon sun, and rays of light filtered into the room. Major support for Readings & Workshops  in California is provided by the James Irvine Foundation  and the Hearst Foundations . Additional support comes from the Friends of Poets & Writers .